Bistek or beef steak Filipino style is quite easy to make. The marinade is simply a balance between lemon and soy marinade, fried at high heat and topped with sauteed onions. My good friend Stel cooked bistek recently, and she prompted my taste buds, especially as I had been eyeing the Radical Chef’s version for a while now too. 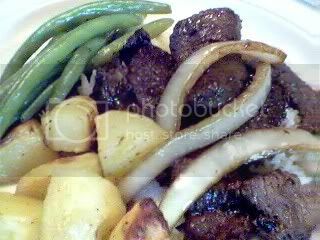 This version was served with fried potatoes and sauteed green beans, but it would have been just perfect with steamed rice, too. Hi Stel, thanks 🙂 The family actually liked this change from the usual steak and potatoes; and it’s just as easy to make! this is the one dish my kids wouldn’t mind eating more than once a week i think…nice bright appetizing photo JMom!